It was about 2AM and we figured the metros were closed now. 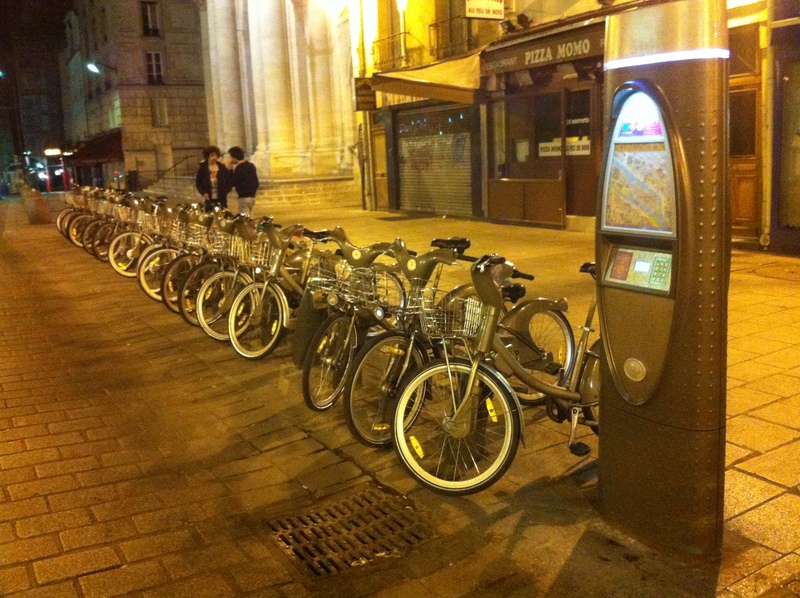 So I downloaded the Velib app and we found the nearest station. There were three bikes. Two out of commission for some reason (red lights) and one with a green light. My vegan friend took that one and we started towards the next station. But then we realized the chain in the bike was wacky. At the next station, she swapped bikes (had to wait 2 minutes in between, so I dealt with mine) but at this station there were about 5 available bikes…. one with a flat tire, two missing pedals, one with another chain issue and another good one. Well, we took the good one and the flat tire and headed to the next station. Pausing here to explain how this works. You need a card with a “chip” in it, like, a French bank card, to take a bike. You read all the agreements, press I Do, swipe your card, they put a little hold on 150€ in case you take the bike or something, and then you’re good. I forget the cost of the ride exactly, but it’s about 2€ for the day, first half hour on a bike is free, then they charge you maybe 1€ for every half hour after that. Somehow you can also use a Navigo pass, but I don’t know how that works. Navigo is the monthly metro pass, which I have. I’ll have to see how that works. Anyway, back to the story. The next bike station was completely full with nowhere to return the bike. It was silly, because we wanted to swap a bike. But we couldn’t take a bike before returning the first one. Blah! Next station, finally got another bike. I think we were practically halfway to our destinations. A few minutes later, we parted ways, so now I was left with nobody to follow. I knew the way home from there, luckily that night it was basically a straight shot to where I wanted to go. So I pedaled my heart out. Then I realized I could switch gears and make it easier. I made it back without a scratch, parked my bike, took a picture, and walked proudly “home.” I say it that way because it’s another temporary residence. I don’t know about riding them during the day, but without the traffic, at night, it was nice. Kind of a clunky bike, but oh my goodness, better than walking when you’ve missed the last train home…. Another great story, Kendal ! I always wondered how the ‘bike sharing’ thing worked. A similar scheme is just starting on a small scale in Toronto. But, weren’t you just a little bit nervous biking through the streets at past 2 AM and all alone? I wasn’t nervous, didn’t seem to be anything to be afraid of. When biking I’m only really scared of potholes and cars. Cars make me nervous.